One of the great ongoing debates in churches is over music. 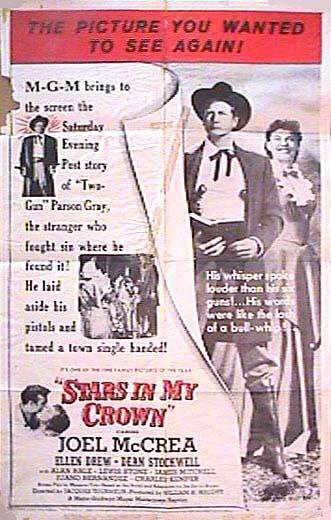 That’s a minor ongoing squabble in the Western, Stars in My Crown. The pastor (the Rev. 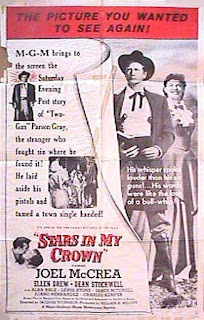 Josiah Doziah Gray played by Joel McCrea) has promised the organist more autonomy in choosing the music, but he continues to insist on including the title theme, "Stars in My Crown," in church services on every opportunity. This movie being billed as a Western, I sort of hoped the disagreement would be settled with gun-play, but it was not to be. I'm very glad that the vast majority of people arguing "hymns vs. choruses" in churches today aren't packing heat. The film follows the career of a small town pastor in a Western town in the years following the Civil War. Josiah was a soldier in the war, and when he comes to Walesburg he still carries his guns. He also wears a long "preacher’s" coat and carries a big Bible. When he enters a saloon, the room quiets. He says, "I'm your new preacher, and I'm giving my first sermon here and now." The men (only men) laugh. The Reverend pulls out his guns, and the men are quiet again. "This is as new to you as it is to me," the preacher says, "So let's start at the beginning." And he reads from the first chapter of the Gospel of John. Pulling a weapon is a unique tool for church growth, but we've seen it before in Movie Churches. In Five Card Stud, Robert Mitchum also brought his six shooters into a saloon to announce he was starting a church -- but he fired his. Preacher Josiah begins his church; he visits and cares for the sick and the poor. He leads worship services in a barn (we hear a congregation sitting on the hay singing "Shall we Gather at the River." The congregation grows and soon decides to build a church. The whole town pitches in; even those who don't attend take up a hammer. Josiah knows almost everyone in town, and he knows their stories. He even provides peace at times; when one man takes a bullwhip from another, the Reverend takes the bullwhip from his hand and whips the bully into the mud. Everyone laughs, even the bully. 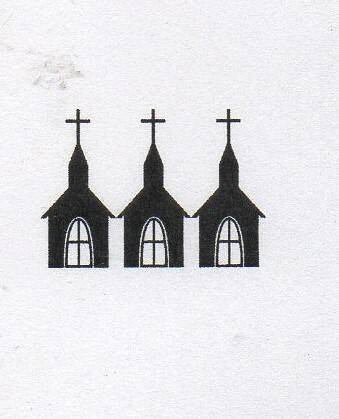 The church grows. The years go on. It’s good that the pastor adopts John (Dean Stockwell), an orphan, because John provides the narration for the film. The film covers two major events in the life of the town and the life of Josiah. One is a typhoid epidemic. A medicine man comes to town with a big show. He first offers the preacher free tickets, figuring that if he wins Josiah’s trust he'll have won the trust of the town (it was different time and place). Josiah won't endorse the show but he does go to it. During the show, John gets sick. Josiah waits through long days and nights with the boy, and eventually, John pulls through. It’s a Sunday morning, and John requests the congregation sing "Stars in My Crown" so that he can hear it next door in the parsonage. A strange thing is we never hear any reference to Josiah’s praying for his adopted son. His unorthodox thoughts on prayer come to light when he leaves his son's bedside to meet a Sunday School class. The preacher asks the kids to raise their hands if they say their daily prayers. Most raise their hands. Josiah then tells them it's okay to pray, as long as they don't end up depending on God so much that they neglect doing things for themselves. From what I know of Scripture, depending on God too much really isn't a possibility. When the kids who were in that class come down with typhoid as well, the town doctor blames Josiah for spreading it. Josiah blames himself for the spread of the disease, too, and cancels services. He goes into seclusion, and without the weekly offering, the pastor and his son find themselves destitute, not even able to afford their daily bread. But when it’s discovered that the school well is responsible for the spread of the disease, all is well. Josiah's second great trial comes from prejudice and greed. An old African American, Uncle Famous Prill, owns property that his neighbors covet. They want to mine the land. When Prill won’t sell, a lynch mob comes after him. This provides an opportunity for Josiah to stand up for justice and what is right. Josiah’s stand wins the respect of an old Civil War buddy who has resisted invitations to come to church in the past, and he finally comes to church as the congregation sings "Stars in My Crown" one more time. The film is quite an unusual character study directed by Jacques Tourneur, director of such classics as Cat People and Out of the Past. 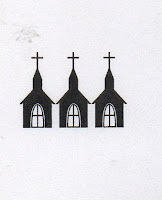 But we're rating the church in the film, rather than the film itself, and Josiah Gray's church rates Three Steeples.